Country Living: Be sure to check other pages for properties that are somewhat smaller than this as you may find something just right there. And don't forget to look under "Farms" as well. Some of the "Acreage" properties have barns, so if you don't need a home, that is another spot to search. 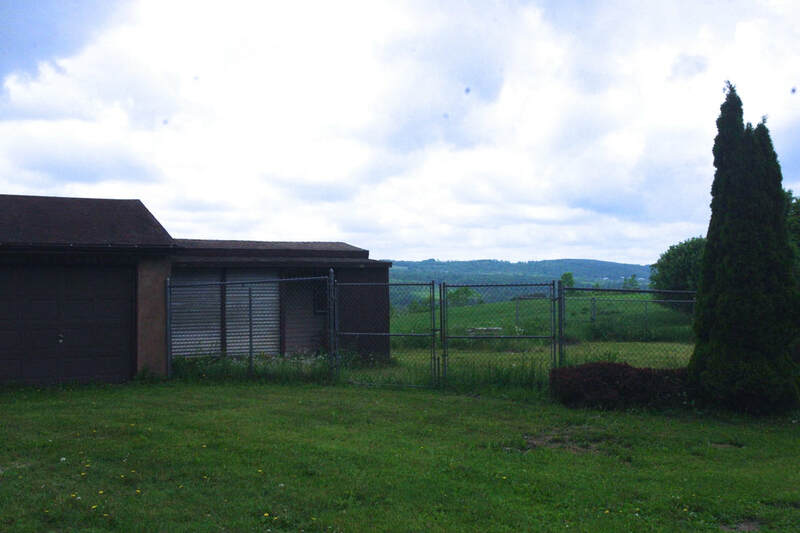 #1128 - South-Eastern Herkimer County - This 85 acre Hilltop Estate features the acreage you want as up to an additional 109 acres can be made available. Every field has long views. It is certified organic and maybe 50acres are in hay meadows and another 20 or so are fields returning to nature - the remainder is wooded. Yes, there is timber value here. This is a quiet location near the Montgomery County line, with Amish neighbors. 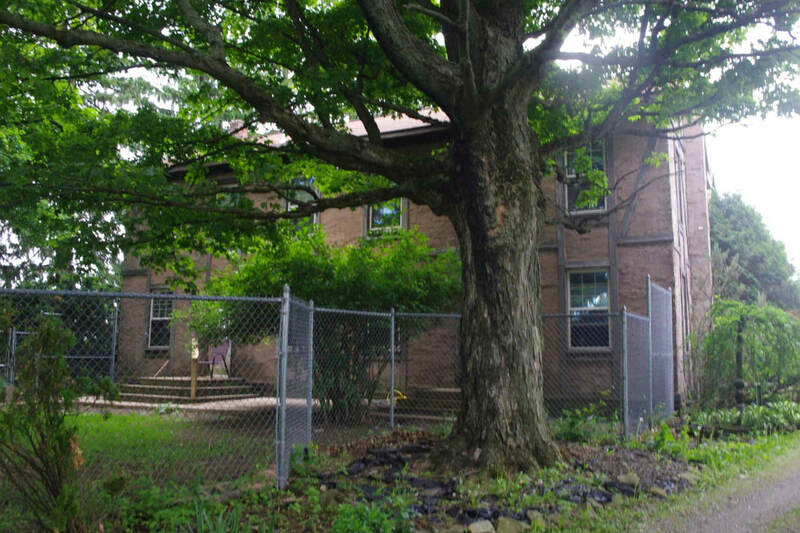 The home is special - built in 1860, it has 4089 square feet of living space, huge spacious rooms. 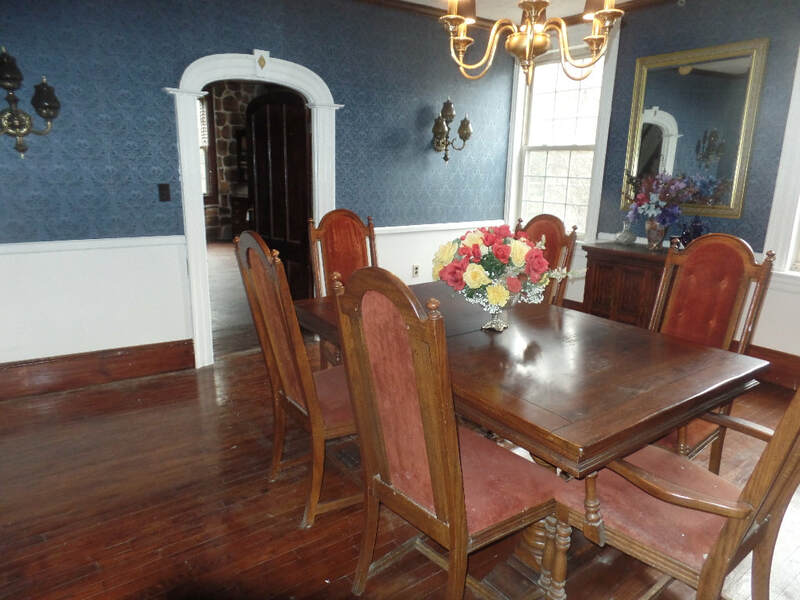 It was thoroughly restored in 1989 and features oak floors throughout, along with much heavy crown molding, exposed box beams, some paneled and some stuccoed ceilings, some hardwood paneled walls and some with heavy wallpaper, ceramic tile where appropriate, thermopane windows throughout, and a stunning formal front hall and stairway. It has 2 large living rooms and 2 large master bedrooms with their own full baths, 3 1/2 baths total. Let’s take a verbal tour through. You enter via double leaded glass windowed doors into a very wide formal hall, with paneled walls and a gracious stairs. 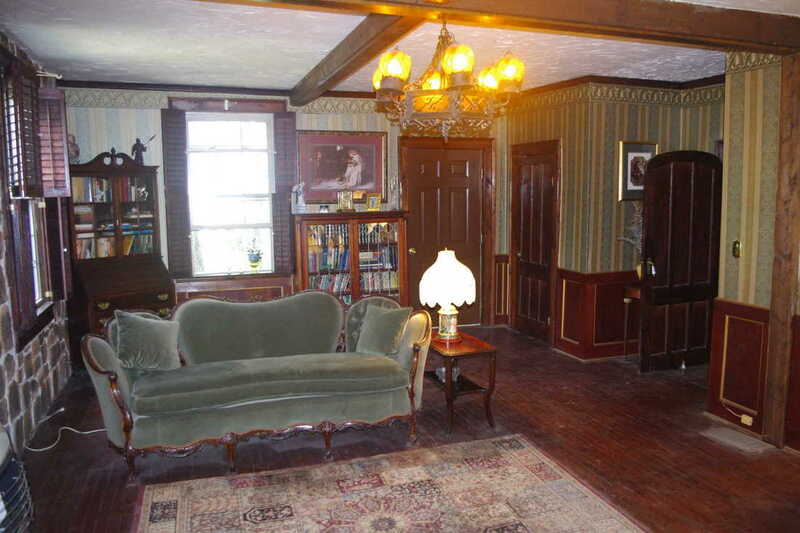 To the right is a living room with a fireplace, box beams and paneling on the ceiling. 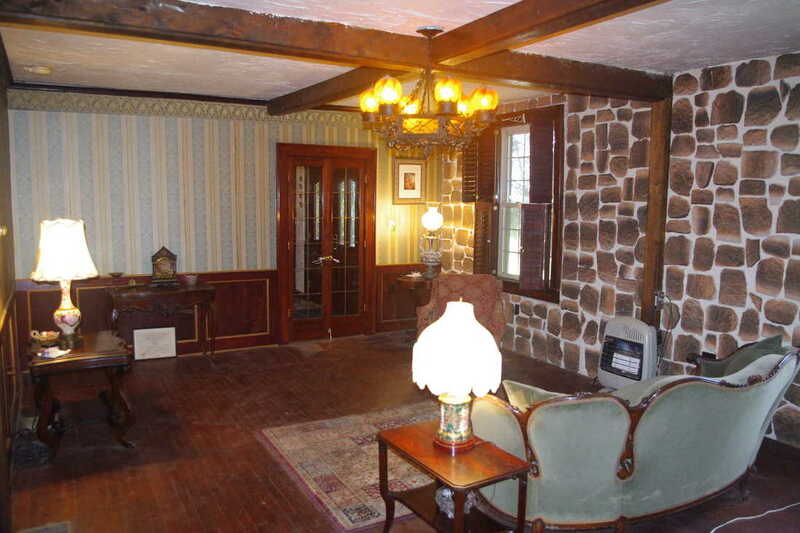 To the left is another huge living room with box beams, oak floors, a stone wall, and supplemental propane heat on one of the wainscoted walls. You can cut through this into the laundry and the downstairs bath and arrive at the formal dining room. A beveled glass door separates the dining room from the hall and an arched doorway leads from it to the adjoining living room. At the end of the hall are 2 rooms. 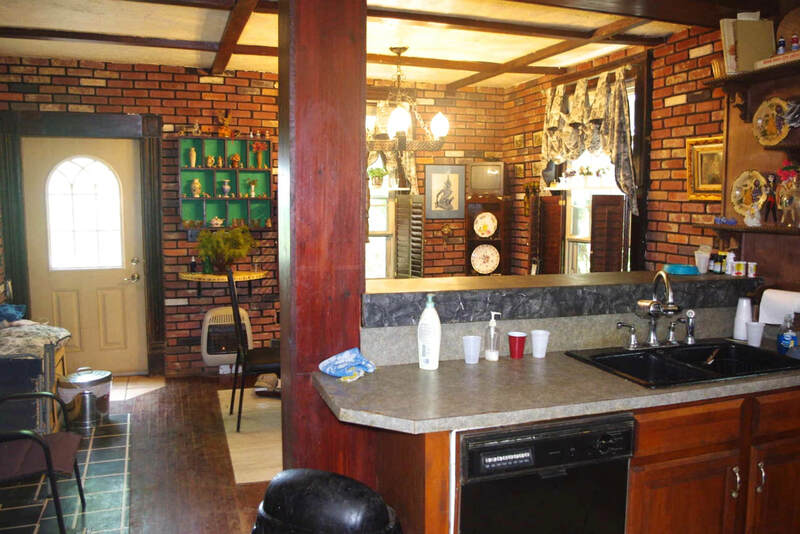 One is a large kitchen with a separate dining room, which features brick walls in the dining area. A long counter separates the two sections of this room. 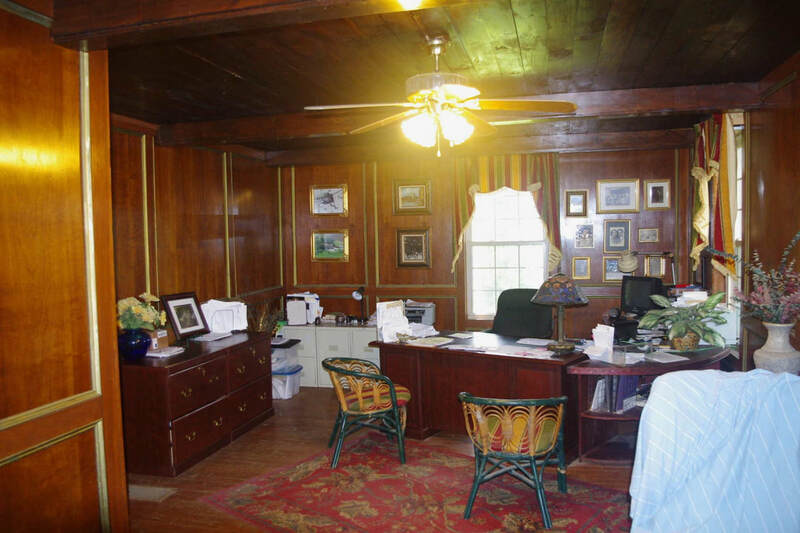 The other room is an L-shaped office where the owner conducts her business Both walls and ceiling here are paneled. Please note that when I used the word “paneled” here , I am NOT talking about cheap 4x8 sheets of cheap fake wood - this is good stuff, done right. Upstairs, one master bedroom features its own dressing room. Ceilings are box-beamed with paneling. A full bath is off this room. 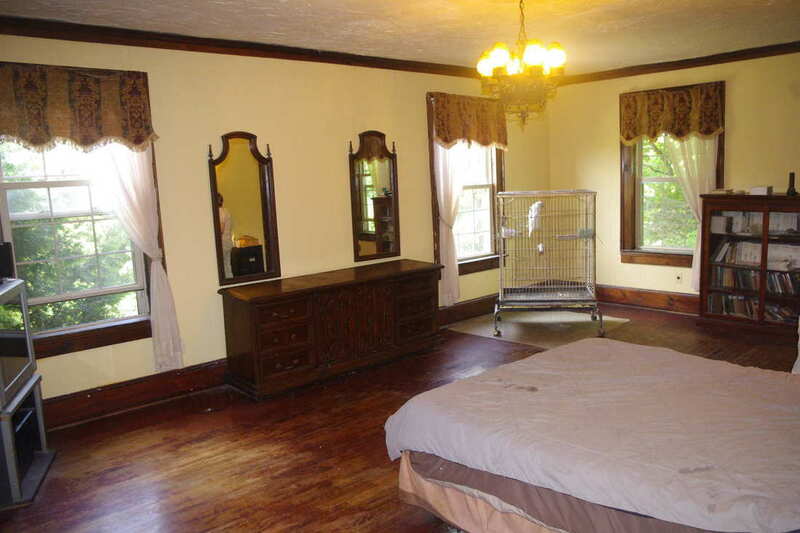 The other master bedroom is even bigger, if you can imagine that. It has it’s own bath, too. 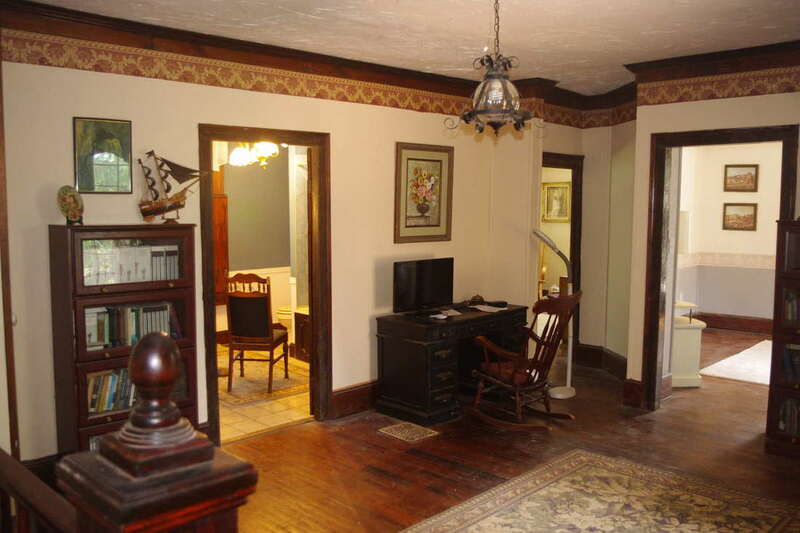 The library separates the two and this room functions as access to the other two bedrooms and the third full bath. Two stairways lead off the library and a pull-down stairs give access to the attic. Outside, the rich and opulent colonial appearance of the interior gives way to a more European feel, with stuccoed walls and exposed exterior beams. The home is hidden in its own tiny forest of gigantic spruce and maple trees, with cedars interspersed in places. There is a 20x30’ 3 car garage. There are a 12x28’ shed (old) and 2 sections of lawn enclosed by chain link fences to make it dog safe. There is also a 12x66’ concrete pad where a trailer once stood. It has it’s own septic. The price is surprisingly low for what this home can offer: $365000 (new lower price). Taxes on the entire 194 acres are under $6000. All appliances are included: range, dishwasher, refrigerator, microwave, washer and drier. ​Note that there are some mirrors and light fixtures that will not stay as they have sentimental value to the owner. The fixtures will be replaced with good quality ones before the closing. #1114 - Central Fulton County - ADIRONDACK HUNTING LODGE 200 ACRES Finest OUTHOUSE in the woods. ADIRONDACK HUNTING LODGE with 200 ACRES in Fulton County, NY. Borders NYS forest. At the end of deeded right of way , with a seasonal road 1/3 mile in from a town maintained road. ​The lodge is 2 story (20x24') plus the 20x8' screened porch. First floor features 2x6" finished walls, fully insulated, bathroom with shower stall and composting toilet. There is a full kitchen with propane stove, woodstove and wall mounted propane heater. Propane lights and it's wired to code for a generator . Upstairs has room to sleep 7-8. Main roof ( metal) was installed 2015, the porch roof received new shingles in 2012. In case you can't see, that's a 6 pointer. AND new in 2016 an Amish built LOG SIDED OUTHOUSE with Solar lighting, THE FINEST IN THE North Woods!.. Overall excellent condition. 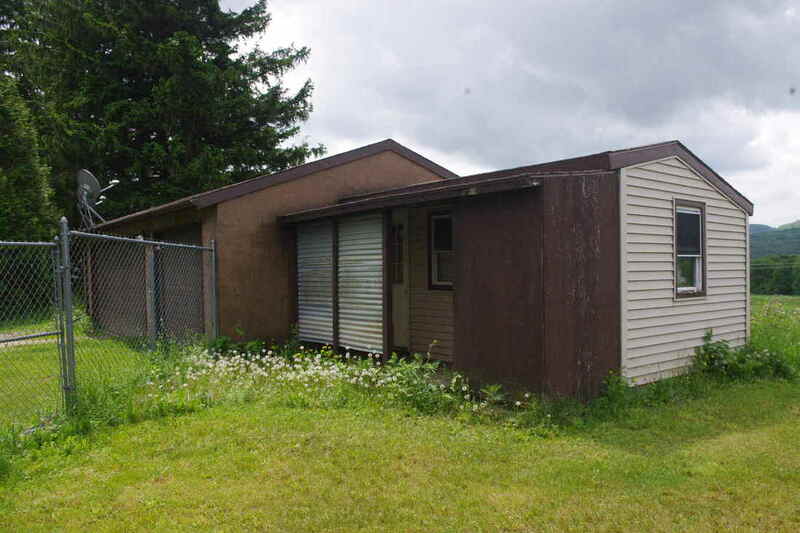 There is a 12 x 10 storage building (the original "lodge" here), metal sided and roofed . No power or running water but there is a dug well next to the camp that is not reliable. The lodge is 4 miles from the Oppenheim Trailblazers snowmobile club ( with a huge ,stunning Log Club house with miles of groomed trails . Also nearby Is The Sprite Club, a 200 acre private conservation club with Rainbow Trout stocked pond , bar and dining ( memberships available). Both are easily accessible by car, ATV or Snowmobile. All town maintained secondary roads in this and the surrounding townships are ATV and Snowmobile usable. Fulton county has 44 Lakes and miles of public stream access for fishing. 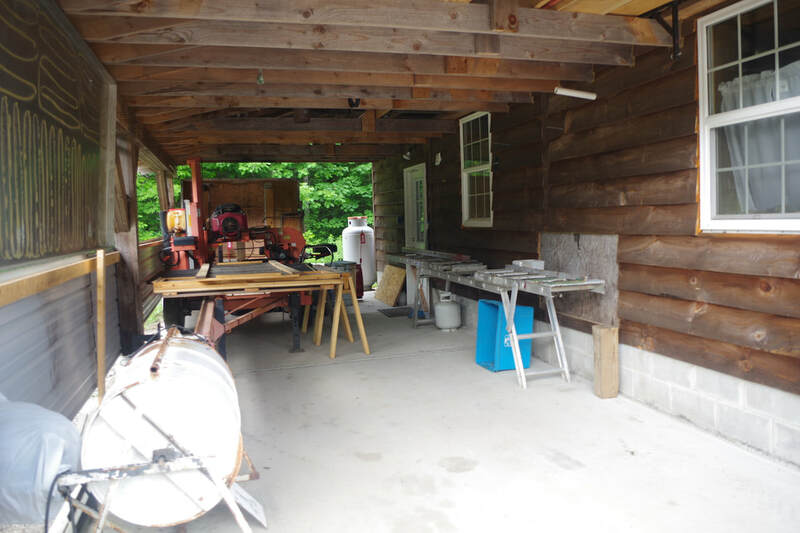 This property is located 30 minutes North of the NYS Thruway exit 29 midway between Albany and Utica.1 hour to Saratoga, Great Sacandaga Lake . Shopping, Hospital, and other amenities just 20-30 minutes away. This property offers privacy, good hunting and EASY access to all the outdoor activities that the Adirondacks are noted for! More hunting land available from 2 neighbors, by arrangement + plus you have at your disposal the entire State Forest which adjoins Total Taxes $3450. Asking only $175,000. Included at this price is a small generator. Questions? Want to visit? Pete Hemmerich is the first person to call - 315-429-0590. #1081 - Eastern Montgomery County - 5 minutes to the Thruway, 30 to Albany, this 50+ acres is always immaculately groomed, a simply gorgeous property. It has over 1/2 mile of river frontage and is already subdivided into 9 parcels (not to worry, they're selling as one). 32 are tillable and in a very good state of cultivation as is a small vineyard. There are three buildings. 1) a winterized and wired cabin, 2) a well built 24x40' shop with a loft that could be converted to an apartment, and 3) the original 3BR mobile home. 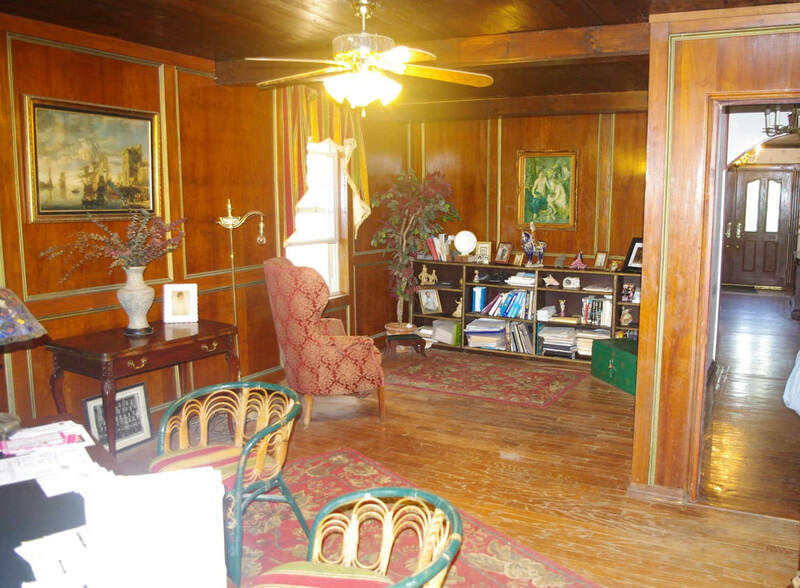 This has not been updated like the rest of the property, but has a large deck with a hot tub which overlooks the river. It can be used as it is as everything works. $215000. Taxes are $3000 and are offset by rental income on the fields. Please be aware the owner has asked us to limit showings to cash buyers only. For more information and photos go to "Acreage" and scroll to the bottom.